Cool enough for the summertime and warm enough for the wintertime. Easy to keep clean. Balances temperature around your body and maintains optimal sleep temperature. It's not too hot. It's not too cold... It's just right. Outlast technology doesn't just wick moisture away from the body—it helps to proactively manage sweat before it begins. When you overheat, your body naturally releases excess heat and sweats to cool the skin. Outlast helps alleviate these spikes in skin temperature that cause sleep disturbances by absorbing and storing the excess heat. As you cool, the stored heat is released back to the body for optimal thermal comfort. This cycle continues throughout the night, so you wake up feeling more refreshed and rested. More than just temperature regulating. 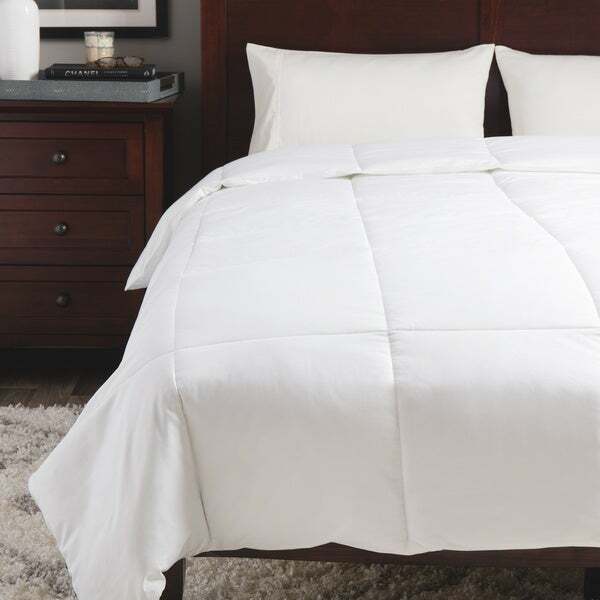 With a super-soft sateen weave, this comforter will keep your bed comfortable and luxurious. The tight-knit weave also repels traditional allergens such as dust mites, which can disrupt sensitive sleepers. Get that cool, crisp, off-the-line freshness every single night. Order your Outlast Temperature Regulating Comforter today! Dimensions 90.0 In. X 108.0 In. X 0.5 In. 'm not sure how I have been living (or I should say sleeping) without this comforter. I have had a very heavy down comforter that has kept me cozy for many years. However, as I get older (sigh) I find that it is just too hot for me to sleep under and often find myself waking in the middle of the night to throw an arm or leg or my entire body from under the comforter. When i saw these reviews I thought it would be worth a good night's sleep to invest, as this is a very affordable comforter, and I am so very glad I did. This has made all the difference in my sleeping. Keeps me cozy but no hot spots during the night. I have been sleeping better and feel much more rested than I have in ages. I love this and would recommend this to anyone that has the "hot comforter blues." This comforter has done a world of help in terms of my wife and I who are always having "too hot/too cold" issues. Even with the cooling properties it's still very comfortable. Definitely a worthwhile purchase. I love this comforter! It is soft, comfortable, and keeps me cool at night. Unlike traditional down comforters it is machine washable. Nice quality and like the ad says, balances temperature. I seem to sweat less at night now. Just bought a temp regulating pillow and mattress pad too. Highly recommend to those who tend to feel hot at night! Reasonably priced as well. Outlast is a wonderful fiber! This comforter is the perfect King size, fluffy like down, and NEVER too hot, as a down comforter can sometimes be! Also, I don't have to feel guilty - that ducks and geese have been tortured by having their feathers ripped off them, and left freezing and bloody - just so that I can have a warm comforter!!! This is my second Outlast purchase - I also have the King size Merino Wool/Outlast blanket, which is so superb that it led me to purchase this wonderful comforter. Now, I'm going to look into the other bedding that contains the Outlast fibers - what a wonderful invention!!! In addition to this comforter, I have "temperature-regulating" pillows and mattress pad on my bed. It seems to me that they all trap and hold heat. This is a very nice comforter. The shell fabric is soft, and the filling stays in place better than down. I have always had down comforters before, but decided to go with down alternative to ease my conscience. I ordered this based on a couple of reviews from people in Florida who said it was comfortable for them. I also live in Florida, and this comforter is way too hot for me. I would have to turn the thermostat down to about 67 in order to not spend the night throwing off the covers and pulling them back again. That just seems like a waste of money and energy. If you live in a cooler climate, or one that is cold in the Winter, I do recommend this comforter. The quality is excellent and, heat aside, it's comfortable. I've tried this for several weeks now, and just can't make it work. I wish I'd sent it back, but maybe I can give it to a friend up North who can make better use of it. Outlast really helped me sleep better throughout the night. It keeps my body at the right temperature to keep me feeling nice in comfortable. I now wake up sweat free and with more energy. The quality is also great. This best bedding product i found. I've had trouble for a long time because of night sweats. My mornings were hard because I wasn't getting a good night's sleep. I discovered the Outlast Temperature Regulating Comforter but I was unsure. I'd never heard of a product made with this technology before, but oh well, I decided to give it a try and purchase it. I wasn't very optimistic, but boy was I off the mark. This comforter is amazing. I never overheat anymore. I not only sleep through the night, but I wake up so refreshed now. It's extremely comfortable too! I highly recommend this to anyone with a sweating problem and even for those who don't. What a great purchase! I was looking to replace my down comforter with a down alternative. I did lots of research and decided this was the one to try. It is soft, warm and cozy however it is not as puffy as I would like. The oversized King is perfect for my California King. That was one of the selling points for me. My husband has the problem with getting too warm. He feels it is a little bit cooler than the down but not much. Overall it is a great product and I would recommend it. I have not washed it yet so I do not have a review on the durability yet. If you find yourself sweating at night or can’t sleep through the night because of changes in the temperature, this comforter is definitely what you need to get. My experience with this comforter since I purchased it has been nothing but positive. I got this with the Outlast Mattress pad and both have changed the way I sleep. It feels so soft, comfy and I don’t have to go back and forth with my girlfriend about the right temperature at night. I definitely recommend this. Not sure this is really Outlast. 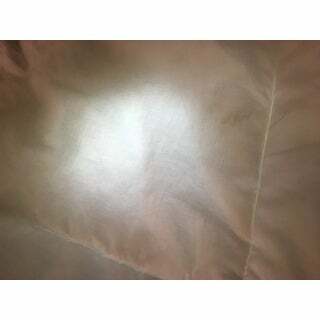 This comforter sleeps hotter than expected and there's no Outlast label on it anywhere that displays the level of certification (Gold, Silver, Bronze). The only indication of Outlast is the printed sheet in the plastic package, which could easily be forged. We have other certified Outlast products, and they all show a pattern for the Outlast layer inside when it's backlit. See the attached photos that shows the 1st photo from this item from Overstock (with no pattern, so no Outlast), and the 2nd photo from our certified Outlast comforter (clearly with pattern, so with Outlast). 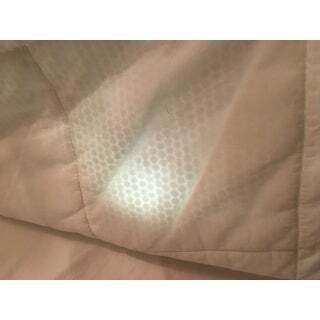 No matter where I shine the light and how hard I look, both sides for this Overstock comforter do NOT show any signs of Outlast material inside. Not happy and buyer beware. This comforter has kept me warm all winter, but isn't heavy or bulky. I am still using it well into spring and still love it. MY FIANCÉ AND I just upgraded to a king size bed and went searching for a comforter. Well just imagine Goldilocks and the three bears. The first comforter was too heavy. The second one was too flimsy and light and then we got this one and it was PERFECT. Not too heavy, not too light just Right! Now we really look forward to getting into bed. And our dog LOVES snuggling on it too. This is a nice big comforter that fits our extremely thick king sized bed. It's a little warmer than I would have liked but it is very nice. You will not get cold no matter how cold your room is if you stay under this comforter. Great comforter that achieves temperature regulation across all seasons as advertised. However, it is very difficult to clean/unwrinkle and, as a result, can become an eyesore. Breathable, does not warm up excessively. I bought it to replace my winter duvet as it started to get warmer and it has served us purpose so far. Good quality and great price. Love this comforter! Used it the first night while waiting for my duvet cover to arrive. Slept like a baby. Wasn't too hot or too cold. We live in NY and it was perfect for our winter. I bought this because I am running warmer than my husband. We had (1) night where we both slept well and (1) night that we both didn't. This is a heavy comforter. Don't know if it was the weight of the comforter or the changes in our lives, lack of exercise or eating too many sweet treats, etc. Going to keep using it for another month. And then we will decide if we want cotton only, inside and out or if we will stay with the Outlast. Perfect weight. Keeps my husband cooler than other comforters. He was always complaining that others were either too heavy or too hot. I put a lightweight duvet cover and it is perfect. This comforter is cooler than all my other comforters but yet warm in the winter. I have intermittent hot flashes and can't tolerate heavy comforters and this one is the best that I've found for keeping me comfortable in winter and summer. This bed is so ridiculously soft and comfy. Still good after I've washed it in the washer. But it does still get a little warm if the room isn't cool enough. So while it helps immensely and I'm not waking up in a full sweat, it's still very warm. "What is the weight of the comforter?" Sorry, meant to add size - King comforter weight, please. "what is the thread count of the sateen ticking?" "This sounds like the perfect comforter for me. But ... my duvet cover is 92 x 96, this is 90 x 98. Will it work? (Fingers crossed)"
It should be fine. The difference is only 2" each way spread over 7.5 by 8 feet! "where do you find duvet covers in the 90 x.98 dimensions? . or is it ok to use a duvet cover with larger measurements?" It's very frustrating to me that there are no standard sizes for comforters or duvet covers. For instance, Queen size can vary by quite a bit depending on what brand it is. Anyway, you should be able to google "90 x 96 duvet cover" and get some results. You can put it in a larger duvet cover, but if it's too much larger, the comforter will move around in the cover. I actually use it without a duvet cover, as I'm worried that anything I put over it will affect the temperature regulating ability. Sorry can't help with this! "Does putting a duvet cover over the comforter affect the cooling process at all?" No, putting a duvet cover on this comforter will not affect the temperature regulating qualities. The Outlast is contained in the fiber fill so even with the duvet the Outlast fiber will still absorb, store, and release heat to keep you at a balanced temperature. "Hello, What are the dimensions for the full size comforter? I can't seem to find that." The full/queen is: • 90” x 98”. I have the same question. The 90 x 98 dimension is for the oversize queen. There is a Full size that can be ordered on its own. I can't find the dimensions for that either. Can you please help overstockcustomercare1? The dimensions for a full are 86 x 86. I had to go to a competitor's website to find out this answer, so I feel that it's only fair that I buy that comforter on thAt website. I think the overstockcustomercare answers could be a little more indepth instead of always going with the answer we can already read on the website. Sorry Overstock, I've bought a lot of items from you, but I've bought even more from thAt other website, and they are eager to answer my questions on any product I have a question about. When you are online shopping you need extra customer service help as you are not able to do the feely/touchy thing as you can do in regular retail. But online sellers are saving a whole bunch of overhead, so a little extra work by customer care is a fair trade off. The more you provide me Overstock, the more I will shop with you!! Thanks! "What is the warranty on this duvet insert?" Hello Smartshopper, the comforter has a one year warranty against manufacturer defects. Thanks for shopping with us!